In chemistry, a formal charge (FC) is the charge assigned to an atom in a molecule, assuming that electrons in all chemical bonds are shared equally between atoms, regardless of relative electronegativity. 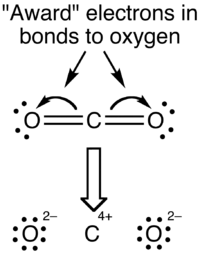 When determining the best Lewis structure (or predominant resonance structure) for a molecule, the structure is chosen such that the formal charge on each of the atoms is as close to zero as possible. 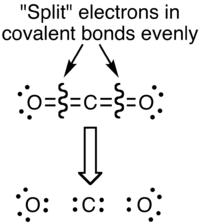 Oxidation states overemphasize the ionic nature of the bonding; most chemists agree that the difference in electronegativity between carbon and oxygen is insufficient to regard the bonds as being ionic in nature. 1 2 Hardinger, Steve. "Formal Charges" (PDF). University of California, Los Angeles. Retrieved 11 March 2016.